For those out there who still have not figured it out yet, Steve Hackett belongs to the great guitar players of our time! Now he has returned with his new album Wolflight, being his first studio album of new, original music since 2011's Beyond The Shrouded Horizon. Wolflight is an amazing album filled with 12 contemporary progressive rock tracks that any guitar aficionado must like as Hackett's guitar playing utterly thrills and intrigues. The new album is a culmination of a vision and dream, namely to bring together disparate musical disciplines, and in doing so to tell a story through music that goes back to the dawn of civilization. Hackett gets musical assistance from Nick Beggs (bass guitar), Gary O'Toole (drums), Roger King (keyboards) and Rob Townsend (saxophone and duduk). Even Chris Squire (Yes) plays a minor role on the album. Furthermore, Hackett uses a full orchestra which adds another dimension to the music. Wolflight has a filmic quality about the struggle against dark forces, the fight for freedom and the triumph of the spirit and it is a musical gem. 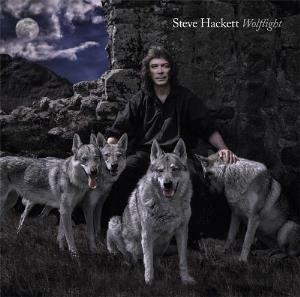 I think Wolflight is Hackett's most evocative, varied, instrumentally overwhelming album and therefore a must for all lovers of great progressive guitar rock. Hackett has worked on this album for more than two years and you can certainly hear that, turn up the volume and enjoy!